Rapper 50 Cent offered to pay Khabib Nurmagomedov $2 million in cash to leave the UFC and join rival Bellator in an Instagram post on Friday. Nurmagomedov's $2 million fight purse was withheld after chaos broke out following his fourth-round submission of returning UFC star Conor McGregor. "I think it's wrong what the UFC is doing to Khabib, they didn't do the same thing to McGregor," 50 Cent, whose given name is Curtis Jackson, wrote in a tweet. "I'll pay 2 million cash tonight if he will fight for me at Bellator." "I'll deal with Dana and your contract later," 50 Cent commented on his own Instagram post, and referring to UFC president Dana White. "The UFC is not the only game in town. 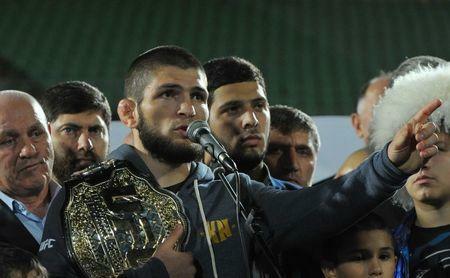 Zubaira (Nurmagomedov's teammate) is welcome also." Nurmagomedov isn't likely to jump to Bellator, where 50 Cent is a brand ambassador, but he did respond to the rapper's offer. "Just send me location," he replied on Instagram, before inviting the rapper to come to Dagestan, the region in Russia where he lives. McGregor, who received his $3 million purse, and Nurmagomedov will be tentatively suspended for at least 10 days on Monday for their part in a brawl that occurred inside and outside the Octagon in their Saturday fight, Nevada Athletic Commission executive director Bob Bennett announced Thursday. Nurmagomedov went into the crowd in an attempt to fight members of McGregor's team after the bout. McGregor also left the cage and threw a punch at a person affiliated with Nurmagomedov. "You can keep my money that you are withholding," Nurmagomedov posted on his Instagram account. .".. I hope it won't get stuck in your throat." Nurmagomedov (27-0) could be in danger of losing his lightweight title after beating McGregor (21-4). White has indicated the UFC could strip Nurmagomedov of the belt. Meanwhile, the next fight of Nurmagomedov's teammate, Zubaira Tukhugov, reportedly was canceled following his role in the brawl that ensued after the Nurmagomedov-McGregor fight. That didn't sit well with Nurmagomedov, who vowed to leave the UFC if it were to fire Tukhugov. "If you decide to fire him, you should know that you'll lose me too," Nurmagomedov wrote on Instagram. "We never give up on our brothers in Russia and I will go to the end for my Brother. If you still decide to fire him, don't forget to send me my broken contract, otherwise I'll break it myself."